To start the program, double-tap over the moving-hand animation. The two balls will begin to move. When they collide with each other or with the sides of the window, sounds will play. You are now in Run Mode. To pause the program when the balls are moving, double tap anywhere on the screen. The balls will stop moving, the sound will cease, and you will see the Menu Bar along the top. You are now in Paused Mode. To resume the program when it is paused, double tap anywhere on the screen. You will go right back to Run Mode. Whether you are in Run Mode or Paused Mode, you can grab a ball simply by touching it with your finger. If you hold onto the ball, that is, if you maintain your touch without lifting your finger tip, you can move the ball around the screen. When you grab a ball, you will see a halo around it. When you are in Run Mode, you can throw a ball that you are holding with your finger tip. When you let go of the ball, it will continue to move in the same direction that you have been moving it. You control the speed of the ball that you throw. While you are grabbing, moving or throwing a particular ball, the remaining balls will continue to move and the sound of colliding balls will continue to play. When you are in Paused Mode, you cannot throw a ball. When you return to Run Mode, any ball that you grabbed or moved in Pause Mode will remain still until you move it. Now that you are back in Run Mode, you can grab, move and throw any ball. When you are in Pause Mode, you can erase and create balls. To erase a ball, grab the ball and then keep your finger tip absolutely still for 1 second. You will see the ball explode and disappear. To create a new ball in Pause Mode, hold your finger tip on any empty part of the screen, keeping it absolutely still for 1 second. You will see a new ball appear. At the left side of the Menu Bar, there are three Sound Profile Buttons, drawn in yellow, which we call triangle, square, and pentagon. In Pause Mode, you can switch between sound profiles simply by touching one of these three buttons. The sound profile that is currently active is shaded with cross-hatching. When you change sound profiles, you will hear a sound to confirm your change. We don't know what to call it: regularization, quantization, grooving, or locking in. Whatever you want to call it, the Slider at the upper right corner of the menu bar does it. Move the slider to the left, and the beat is locked in. Move the slider to the right, and the beat is unlocked. You can touch the green square-shaped clock to move the slider immediately to the extreme left. You can touch the green circular-shaped clock to move the slider immediately to the extreme right. In Pause Mode, you can save and retrieve your own compositions. The Save Button and Retrieve Button are drawn in white in the middle of the Menu Bar. The Save Button has a downward arrow. The Retrieve Button looks like a partially open folder. To save your composition, touch the Save Button. The Save Button will flash and four Memory Buttons will appear in place of the Slider. You are now in Memory Mode. The Memory Buttons are numbered 1 through 4. Select a Memory Button simply by touching it. The Memory Button that you touched will briefly flash on and off, after which you will hear a sound to confirm your save. The flashing Memory Button and the confirming sound help you to make sure that you have saved your work. Now you are back in Paused Mode. When the Save Button is flashing and Pluto Pluto is awaiting your choice of Memory Button, you may decide that you don't want to save anything. If so, you can escape simply by touching anywhere on the screen other than a Memory Button. Pluto Pluto will go back to Pause Mode without saving anything. You will not see any Memory Button flash and you will not hear any confirming sound. To retrieve one of your saved compositions, touch the Retrieve Button. The Retrieve Button will flash and the same four Memory Buttons will appear. If a Memory Button contains no saved composition, it will be drawn entirely in white lines. If a Memory Button has a saved composition, it will have a yellow highlight directly above the button number. Select a Memory Button simply by touching it. The Memory Button that you touched will briefly flash on and off, after which you will hear a sound to confirm your retrieval. You will notice that the balls have moved, the sound profile has changed, and the slider position has changed. Double tap to play your retrieved composition. When the Retrieve Button is flashing and Pluto Pluto is awaiting your choice of Memory Button, you may decide that you don't want to retrieve anything. If so, you can escape simply by touching anywhere on the screen other than a Memory Button. Pluto Pluto will go back to Pause Mode without retrieving anything. You will not see any Memory Button flash and you will not hear any confirming sound. After you have retrieved a previously saved composition, you can grab, move, throw, create and erase balls as you did before. You can reuse a Memory Button any time you want, overwriting any composition previously saved in that button. Your compositions will be saved as long as you keep Pluto Pluto on your iPhone or iPod Touch. If you close Pluto Pluto and restart the program later, your saved compositions will still be there. However, if you delete Pluto Pluto and reinstall the program, your Memory Buttons will be empty when you restart it. You can exit Pluto Pluto simply by pressing the Home Button at the bottom of your iPhone or iPod touch at any time. You can grab, move and throw only one ball at a time. The maximum number of balls is three. If you try to create a new fourth ball, nothing will happen. You can erase all three balls and start over, once again creating new balls. Nothing will happen when you turn your iPhone or iPod Touch sideways, or when you shake it. In Pause Mode, you can actually move all three balls on top of each other. (This takes some practice.) However, when you're back in Run Mode, the balls will separate from each other as soon as you touch them. You can jam the balls against each other, creating a sound effect that we call "rattle." This is not a bug in the program, but something that we decided to leave as an option. If you grab and move the balls that you have jammed, the rattle will go away. If you're an experienced composer, you can move the balls, change the sound profile, or retrieve your compositions when the program first starts up, even before you double-tap over the animated hand. We did not program Pluto Pluto to automatically resume exactly where you left it last time. To resume where you left off, just save your composition in one of the Memory Buttons before you exit the program. If your iPhone receives a telephone call while you are running Pluto Pluto, then program will close down. 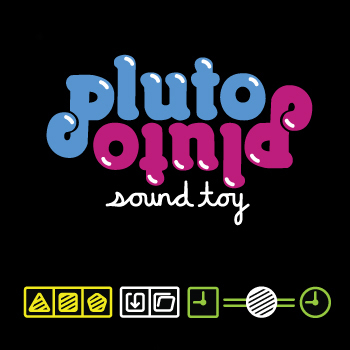 When your phone call is over, Pluto Pluto will automatically start up at its opening screen. If your iPhone runs low on memory (for example, when you have open multiple windows of Safari at the same time), Pluto Pluto will simply close down without warning. If Pluto Pluto continues to close without warning, you can solve the problem simply by turning your iPhone off and on again.